Waves crash onto second beach on the Olympic Peninsula. 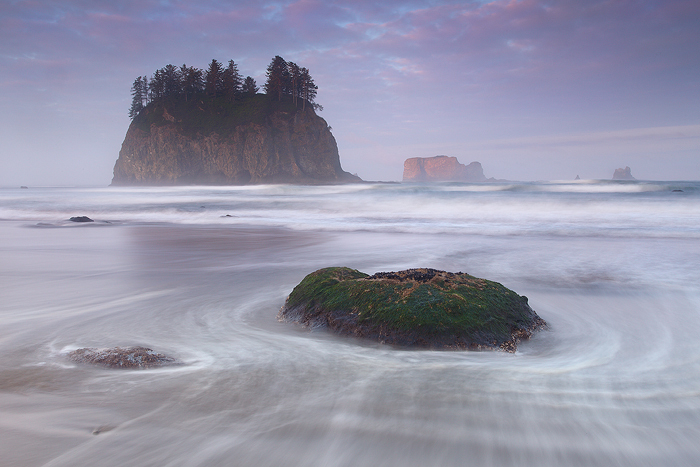 A slow exposure shows the water rushing back into the sea. Peaking my head out of tent, it was still dark, but I could tell there were clouds. Hoping for a good sunrise I set out for the beach with my gear. Standing knee deep in freezing ocean water is the perfect way to get a morning started. As I waited for the sun to come up a family of river otters surfed in the waves right in front of me. Mornings like this are the reason I love doing what I do.